This is the second post in the series. 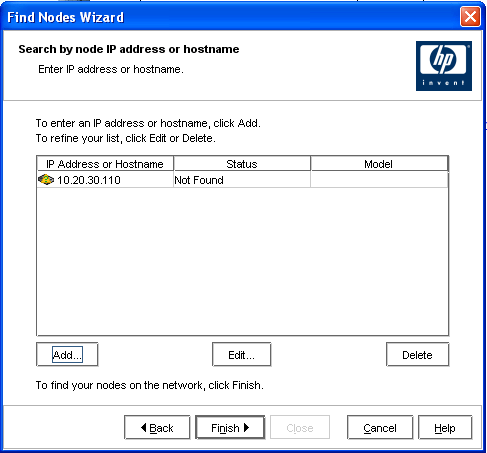 In the first post I explained how to get the VSA, install it in VMware, and set its static IP. 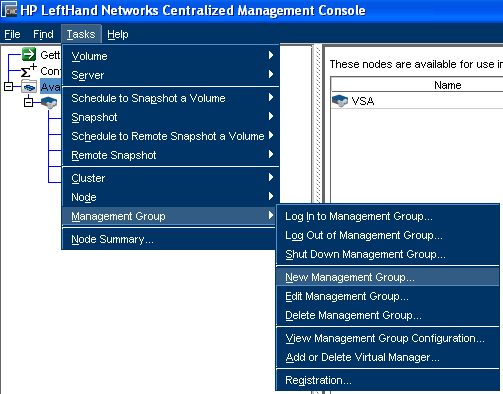 In this post we are going to finish the actual configuration of the VSA using the LeftHand CMC. So if you haven’t installed the CMC from the VSA download do so now. Then double click the link on your desktop and let’s get started. After the CMC finishes loading it should come up with a status window that says “Searching for Nodes”. 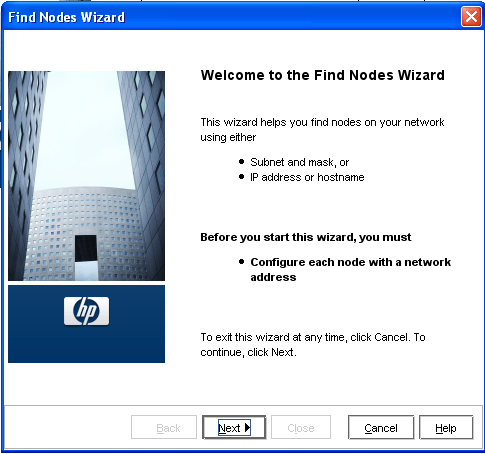 After a few seconds it should go away and you should be prompted with the “Find New Nodes Wizard” as shown below. After you press FINISH the CMC will run a quick search and after the status menu goes away you should notice the status changed to “Newly Found”. Press close to exit the wizard. You should now be back at the main CMC window. On the far left your VSA should be displayed and you should be able to hit the plus sign next to it to expand its options. As you can see on the screen below it found my 10 gig disk. Now lets get it ready to attach to a ESX machine. Click on the “Tools” menu at the top of the screen, select “Management Group”, and then select “New Management Group”. 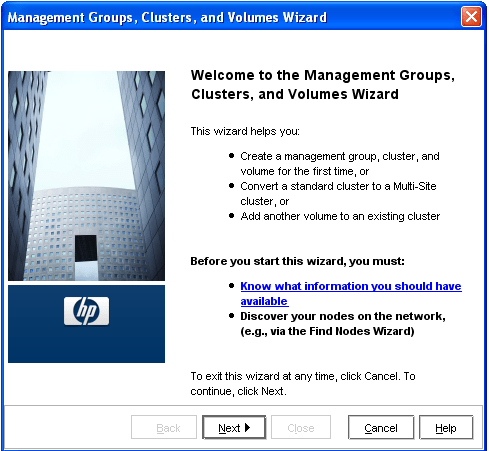 The new Management Group Wizard should appear as shown below right. Click NEXT. 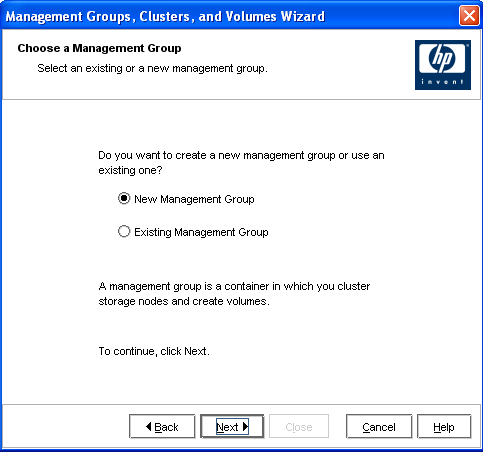 Ensure the “New Management Group” option is selected and press NEXT. On the next screen give the Management Group a name (I’m pretty generic: MG1) and ensure that your node is selected. 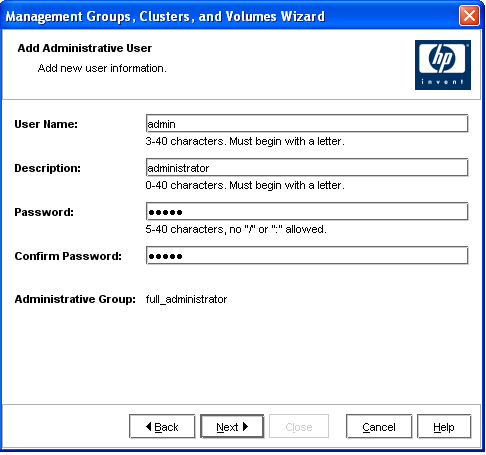 On the next screen it forces you to create a new admin user to use when you login into the Management Group. Enter in the required information and press NEXT. On the next screen you are requested to set the time. I always use NTP servers and I set the NTP server as an IP address so that if DNS goes down we still have NTP. 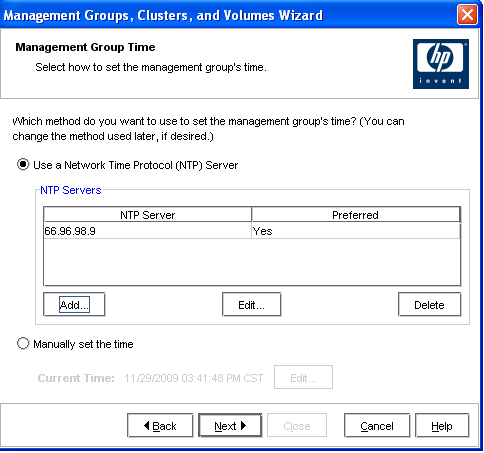 Set a NTP server or do it manually, then press NEXT. 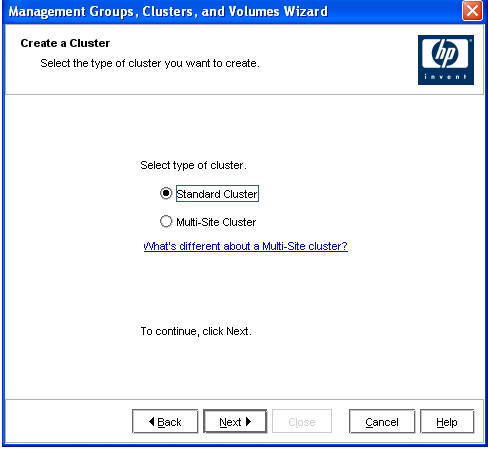 Ensure “Standard Cluster” is selected on the next page and press NEXT. We’ll get into Multi-Site configurations later on in a different post. Now comes the fun part. We need to create a cluster. 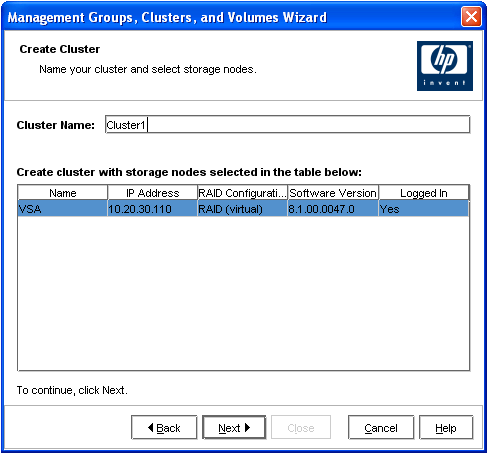 Clusters are what ISCSI initiators communicate with and with LeftHand a cluster is 1 or more nodes. For now it will be just one node but we still need to configure the cluster. 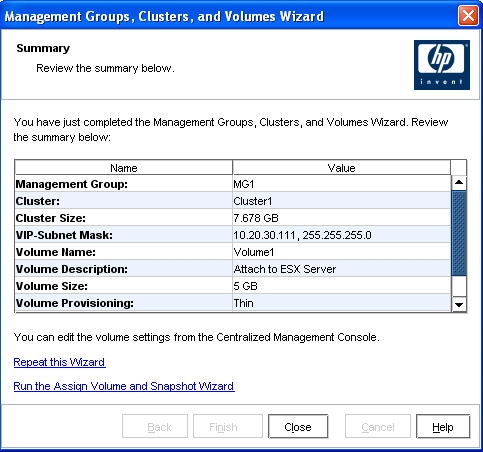 Give it a name, ensure your VSA is selected, and press NEXT. 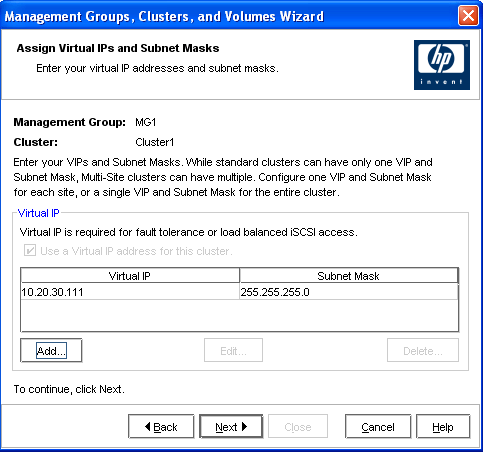 Now we add the VIP (Virtual IP) for the cluster. 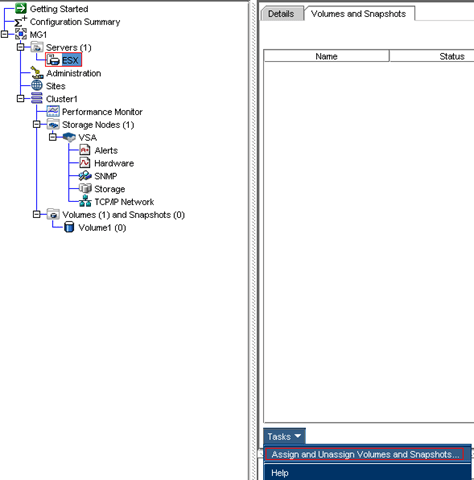 Again this is what ISCSI initiators will use for their connection to the VSA. 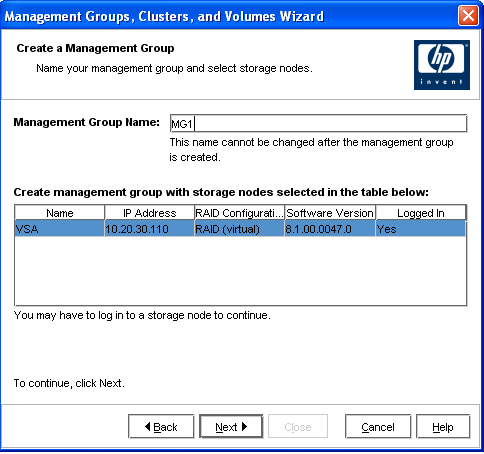 Nodes can still be managed with their own IP address, however it’s best practice to use the cluster VIP for ISCSI traffic. Add a VIP and then press NEXT. 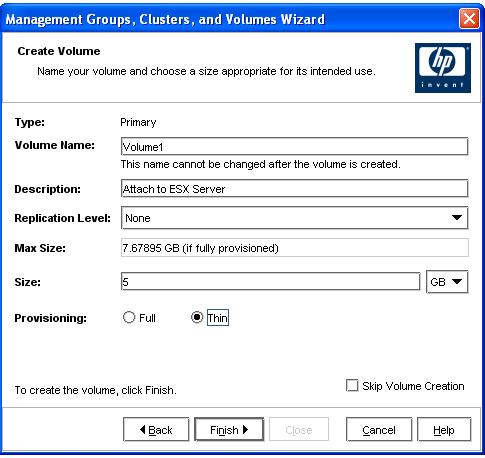 The next screen gives you the option to create a volume in the cluster. If you don’t want to create the volume right now check the box that says “Skip Volume Creation” and just press FINSIH. I’m going to go ahead and create a 5 gig volume right now. Give it a name, description, set the volume size, choose thin of full provisioning (I always use Thin), and then press FINISH. So the bottom line here is that if you only need a single node that can do snapshots and acts as a enterprise level ISCSI target; this is a super good deal. I need to be very clear here though that the VSA should ONLY be used for testing purposes unless you have purchased an actual VSA license. If you are interested in the other features or in purchasing, contact your local HP reseller. On the next screen enter your Server information. This includes either selecting CHAP Authentication OR entering the initiator’s node name. 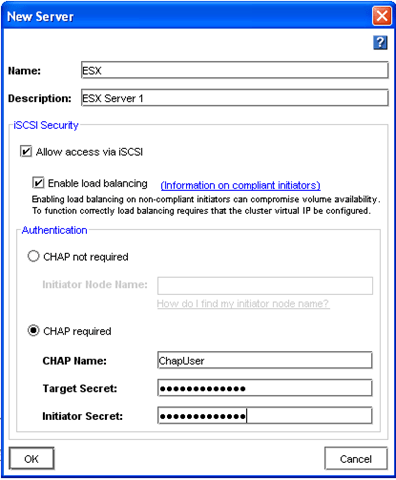 Since we haven’t setup ESX yet for ISCSI I’ll configure CHAP Authentication. Enter your information and press OK.
On the next screen the volume you created earlier should appear. Simply check the “Assigned” box next to the volume name and then press OK.
That’s it! 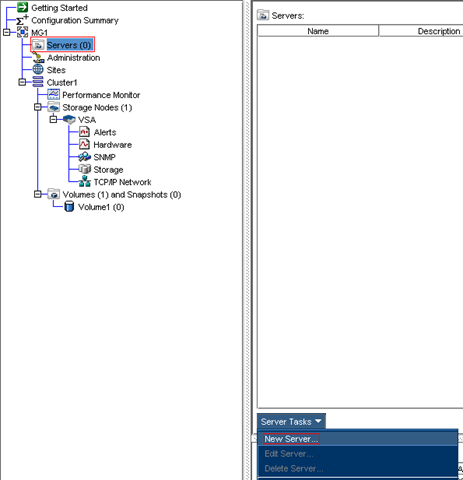 The rest needs to be done from the VMware side but at this point you have successfully installed a Enterprise level Virtual ISCSI target, provisioned it, created volumes, and assigned them to servers. 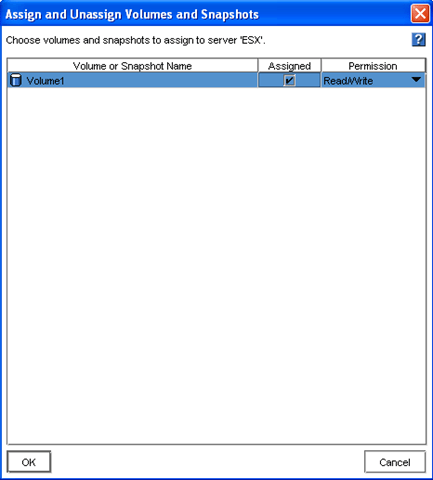 More to come in the next post where we attach to the volume to ESX. No Problem! Thanks for reading, Im heading over to your blog right now to check it out. Thanks for the clear documentation you have made. It is very useful and very handy for a person like me who needs to touch the storage technical segment for the first time.